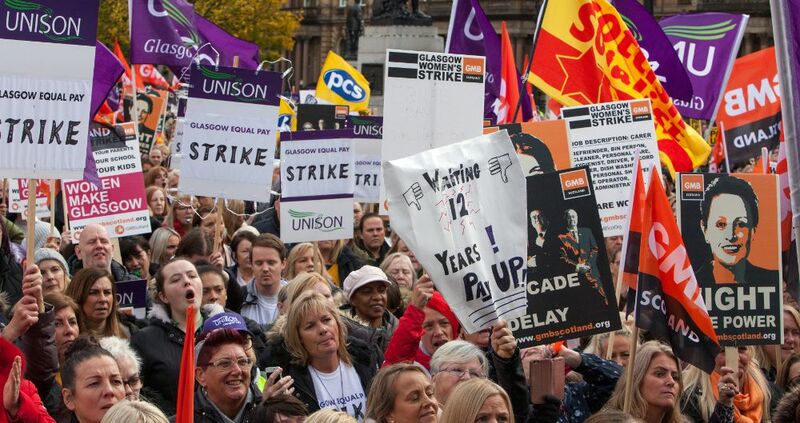 Equal pay strikers have won a massive breakthrough in their long, hard battle for equal pay justice in Glasgow City Council. No exact calculations and individual payouts to the thousands of (overwhelmingly) women who have suffered years of daylight robbery of their wages will occur until at least the summer. But the city council leader has at last accepted the principles and methods of calculating compensation for this historic injustice, and publicly stated so, after the unions and claimants’ lawyers had earlier this week presented the council negotiators with a revised ‘take it or leave it’ proposal to settle the painfully long battle. Although the formal decision on the calculations and payment plan will have to be ratified at a Council meeting later this month, there can be no going back now. A victory has been won through the determination, solidarity and spirited collective action of working class women and men. As we have described in detail in previous articles this battle for equal pay goes back to at least the council’s 2006 Workforce Pay and Benefits Review. 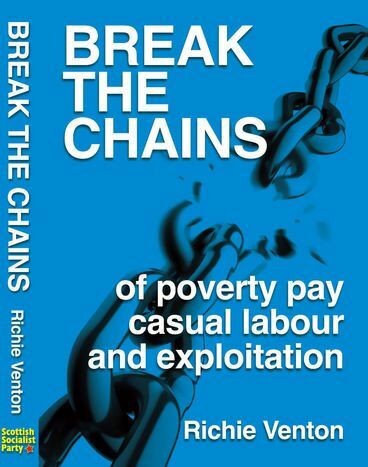 The pay system implemented by the previous Labour council meant workers – about 90% of them women – in the likes of care, catering, cleaning and classroom assistants, have been paid £3-an-hour less than if equal pay had been enforced. Estimates are of at least £35,000 each in compensation, for all these years of being robbed of the wages they deserved. And the stain can never be removed from the council’s record that many women died before winning pay justice. Attempts by Labour to score points against the current SNP council leadership on this issue are absolutely shameless. After all it was Labour which not only introduced and presided over a pay structure that the Equality & Human Rights Commission ruled to be discriminatory; it was the same Labour council which squandered over £2.5million of public funds to challenge these rulings in the courts, to block equal pay being implemented. But for the SNP leader to put a brave face on this outcome by claiming she never had any hesitation in achieving pay justice for these thousands of workers is also challenged by the facts, to put it mildly. 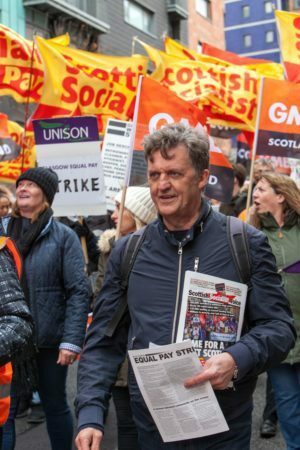 The strike action in October was not a cunning plan by Labour to discredit the SNP council, as some ultra-loyal nationalists claimed, as they denounced the strike action. 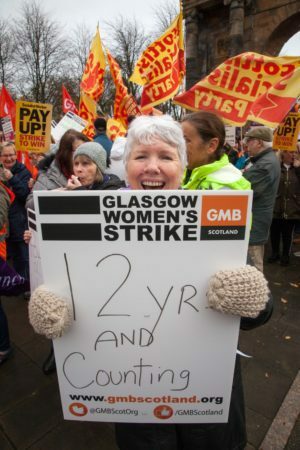 The strike was driven from below, by thousands of mostly women workers who had lost all patience in the delaying tactics of the new SNP council. After pledging to implement equal pay justice in their 2017 council election manifesto, the SNP administration had produced absolutely no concrete plans for compensation and equal pay after a grand total of 22 meetings with the unions since January 2018. 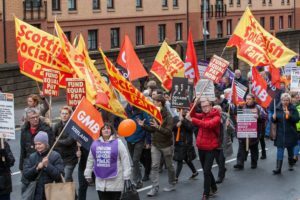 The unprecedented, spirited strike of 8,000 Unison and GMB union members on 23/24th October concentrated the minds of the foot-dragging council leadership wonderfully! This outcome – when it’s implemented – is a victory for the biggest equal pay strike in UK history. It’s a victory for the courage, determination and flair of workers who lobbied, staged street theatre, eloquently explained their case in the media…and above all, went on strike. It’s a victory for women workers across society, still subjected to the gender pay gap that helps fuel supercharged profits in the private sector; part of austerity in the public sector. And it’s a victory for the tremendous solidarity of workers in the face of attempts to divide them. In particular, for about 600 male workers in the cleansing depots – the very same workers whose wages were used as the comparators in this equal pay battle – who refused to cross the picket lines of women strikers, despite threats from top management for taking such illegal ‘secondary’ action. Back in 1968 it was the strikes by women machinists in Fords Dagenham which won the Equal Pay Act. But it took a later and longer strike by the same workers to get that piece of legislation actually implemented! Fifty years on, it’s taken the struggle and solidarity in strike action of workers to win an historic breakthrough in the battle for equal pay. 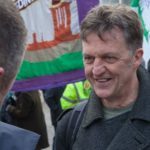 Now the same solidarity and vigilance will be required of workers and their unions to prevent the £500m compensation bill being funded by cuts in the council. Tories Admit Guilt – But Continue Insecure Work CrimesReject American imperialism – Support Venezuela!